a-ha (normally spelled entirely in lower-case) was a rock/pop music band from Norway. The band was founded in 1982 by Morten Harket (vocals), Magne Furuholmen (keyboards), and Pål Waaktaar (guitars). The group initially rose to fame during the mid 1980s after being discovered by musician and producer John Ratcliff and has had continued global success in the 1990s and 2000s. According to their official website, they have sold over 36 million albums worldwide plus more than 25 million singles, making them the best-selling Norwegian music act in history and the second-best-selling act from Scandinavia, after ABBA. a-ha achieved their biggest success with their debut album, Hunting High and Low, in 1985. That album peaked at number 1 in their native Norway, number 2 in the UK and number 15 on the U.S. Billboard album chart, yielded two international number-one singles, “Take on Me” and “The Sun Always Shines on T.V.”, and earned the band a Grammy Award nomination as Best New Artist. In the UK, Hunting High and Low continued its chart success into the following year, becoming one of the best-selling albums of 1986. In 1994, after their fifth studio album, the band went on a hiatus. Following a performance at the Nobel Peace Prize Concert in 1998, the band returned to the studio and recorded their sixth album, 2000′s Minor Earth Major Sky, which was another number-one in Norway and resulted in a new tour. A seventh studio album, Lifelines, was released in 2002, and an eighth album, Analogue, in 2005, was certified Silver in the UK — their most successful album there since 1990′s East of the Sun, West of the Moon. Their ninth album, Foot of the Mountain, was first released on 19 June 2009 and returned the band to the UK Top 5 for the first time since 1988, being certified Silver there and Platinum in Germany. The album peaked at number 2 in Norway (their first not to reach number 1 in their home territory). On 15 October 2009, the band announced they would split after a worldwide tour in 2010, the Ending On A High Note tour, which culminated in four farewell shows in Oslo on 30 November, 2, 3 and 4 December 2010. The trio—composed of lead vocalist Morten Harket; guitarist Paul Waaktaar-Savoy (previously known as Pål Waaktaar until 1994); and keyboardist Magne Furuholmen (informally known as “Mags”), formed in 1982 and left Norway for London in order to make a career in the music business. They chose the studio of musician, producer, and soon-to-be-manager John Ratcliff because it had a Space Invaders machine. John Ratcliff introduced them to his manager, Slater, and after a few meetings, A-ha enlisted Ratcliff as manager too. Slater and Ratcliff formed T.J. Management. Ratcliff dealt with technical and musical aspects, and Slater acted as the group’s international business manager and as liaison to Warner Brothers’s head office in Los Angeles. An early version of “Take on Me” was the first song that Morten Harket heard Magne Furuholmen and Pål Waaktaar play in Asker. At that time, the song was called “The Juicy Fruit Song”, and the two men were still known as Bridges. It was named “Lesson One” when it was first recorded by A-ha. After some rewriting, multiple re-recordings, and three releases, “Take on Me” became a hit on both sides of the Atlantic in 1985 and was the second-best-selling single of 1985. The first version of the song, released in 1984, was promoted by a now-rare video of the band performing the song in front of a blue background. The song was then re-recorded with production by Alan Tarney, but both of these released failed to chart. It was then re-released with a new, groundbreaking video which peaked at number 1 on the U.S. Billboard Hot 100 and at number 2 on the UK Singles Chart. A-ha became the first Norwegian band to have a number 1 song in the U.S. The song’s popularity earned the band a spot on the American television series Soul Train in 1985, making them one of the few white artists to appear on the black music-oriented show. Sales were aided in the U.S. by heavy rotation on MTV of the new music video, which may have been inspired not only by the truck-chase scene from Terry Gilliam’s film Brazil but also by the climactic scene from Ken Russell’s film Altered States. The video used a pencil-sketch animation / live-action combination called rotoscoping, in which individual frames of live video are drawn over or colored. It became one of the most instantly recognizable and most enduringly popular music videos in the U.S., where it was nominated for eight awards at the third annual MTV Video Awards in 1986, winning six, including Best New Artist in a Video, Best Concept Video, Best Direction, Best Special Effects, and Viewer’s Choice. “Take on Me” was also nominated for Best Video of the Year at the 1986 American Music Awards. Their six MTV Award wins for that video gave them twice as many wins as Michael Jackson’s “Thriller” and more than any artist in the three years of the awards combined. But those were not A-ha’s only MTV awards that year. The band’s second single was “The Sun Always Shines on T.V.”. In the U.S., the song peaked at number 20 on the Billboard Hot 100 and reached number 17 on Radio & Records airplay chart. A remix version was a club hit, rising to number 5 on the Hot Dance Singles Sales chart. The music video for the song was another popular and critical success, nominated in three categories at the 1986 MTV Video Music Awards and winning two awards, for Best Cinematography and Best Editing, bringing A-ha’s total to eleven nominations and eight wins. The following year, Peter Gabriel would earn thirteen nominations and win nine awards, also for two videos. In successive years, even as the award categories have expanded, only a few artsts have approached—and none has surpassed—the single-year award totals of A-ha and Gabriel. A-ha’s American success culminated in their 1986 Grammy nomination in the coveted Best New Artist category, which was eventually won by Sade. “The Sun Always Shines on T.V.” turned out to be A-ha’s last Hot 100 Top 40 single, and to this day in the United States, A-ha is remembered by the general public almost entirely because of the singularly number one hit single, “Take on Me”. As such, the band is frequently considered a one-hit wonder there, despite their two Top 40 hits. In the UK, however, the story was very different: “The Sun Always Shines on TV” was an even bigger hit among British fans than “Take on Me”, peaking at number 1. In the UK, A-ha enjoyed continued success with two more hit singles from the same album—”Train Of Thought” and “Hunting High And Low” (with another innovative video) —and the band remained popular throughout the 1980s and early 1990s. The band’s first album, 1985′s Hunting High and Low, became a worldwide bestseller, spending most of October and November in the top 20 of Billboard’s Top 200 album chart. The album and its four hit singles garnered international recognition for A-ha. Hunting High and Low earned triple platinum status in the UK, and reached platinum status in the US and Germany, while earning gold in Brazil and the Netherlands. Hunting High and Low has sold 11 million copies worldwide. The album peaked at number 15 in the U.S., according to Billboard music charts and has peaked at number 2 on the UK charts, and it spent 38 weeks in the top 10 in Norway, including 8 weeks at number 1. 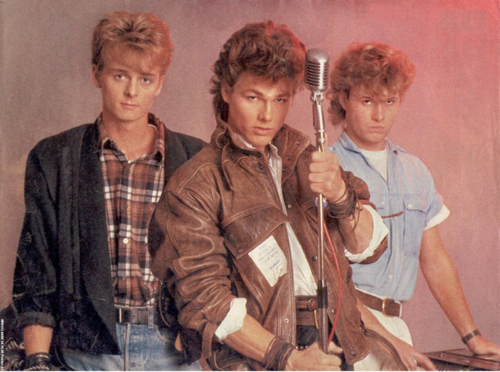 In May 1988, A-ha released their third studio album, titled Stay On These Roads, which matched the number-two chart peak of its two predecessors on the British album charts. Stay on These Roads has been certified Platinum in Brazil and France and Gold in Switzerland, Germany, UK, and the Netherlands. The album includes the title-track theme song to the James Bond film The Living Daylights. The version that appears on their album is a re-recording of the film version and single. The band has said that they are particularly proud of the title track, and all three members contributed to its writing. “Stay On These Roads” and “The Living Daylights” would remain a part of their live set throughout the rest of the band’s history. After the release of the album, the band went on a 74-city world tour. The album has sold more than 4.2 million copies worldwide.